Enter to win $1,000 prize provided by Parent’s Magazine! SWEEPSTAKES PERIOD: The Parents Good and Ready Sweepstakes (“Sweepstakes”) begins at 12:01 AM EST on September 1st, 2017 and ends at 11:59 PM EST on October 15h, 2017 (“Sweepstakes Period”). LIMIT: One (1) entry per person and per email address. 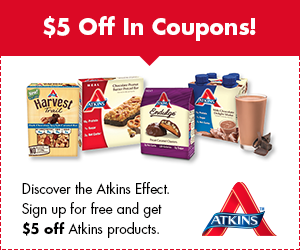 FREE Atkins Diet Quick-Start Kit Today! You get all this for Free! Hurry and sign up while supplies are available! GO HERE to get yours!! Just choose the “ship to me” option when filling out the form. This would be so helpful for Christmas shopping!